MICHELLE OBAMA flew into Malaga yesterday afternoon with her younger daughter, at the start of a four-day luxury Marbella holiday during which they will have at least 68 Secret Service staff keeping watch over them. Their safety will also be ensured by some 250 Spanish police and Guardia Civil. Meanwhile husband Barack was celebrating his 49th birthday alone in Chicago… unaware that astrology.com stargazer was predicting ” It’s a good time to get lost and let your subconscious mind work things out, so stall for as much time as you can” for celebrants with birthdays on August 4, 2010. 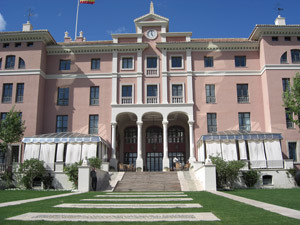 Despite initial Spanish media hype about the likelihood of the US President joining Michelle during her visit to Spain, normally reliable Spanish sources told the EWN that the First Lady and their daughter Sasha, aged 9 were not expecting him to join the family holiday being spent in the luxurious and palatial surrounds of the 5-star Villa Padierna Hotel. However, the White House has confirmed that they will be meeting with the Spanish Royal family when they travel on to Mallorca where the royals are staying at the Palacio Marivent like every summer. While daddy works on, the Obama’s elder daughter 12-year-old Malia Ann is enjoying Summer Camp, the location of which has not been revealed. Meanwhile, two publicity agencies which put up billboards reading ‘Welcome Obama Family. Thanks for choosing Marbella’, have been forced by Marbella Town Hall to remove them.